One great region in CVNP is the Ritchie Ledges. There are now 61 United States National Park Unites thanks to the recent addition of Indiana Dunes National Lakeshore! While we won’t be changing our name to Hashtag 61 we definitely love seeing the additional conservation of land and the public priority on caring for spaces like this that we love so much. The hometown of Hashtag 59 (Columbus) rests in a state that is also home to one of the 61 Parks; our only National Park in Ohio is called Cuyahoga Valley National Park. Come explore the only National Park in my home state and be charmed by CVNP. You definitely won’t want to forget your mountain bike and if you are a music lover you’ll want to save a half day for before or after your visit and make a stop at the Rock N Roll Hall of Fame in Cleveland! Waterfalls. Taking a trip to CVNP should not be complete without a visit to this overlook and waterfall: Brandywine. A short paved loop trail is available to see the 67 foot Brandywine Falls at many different angles and the trailhead offers other jumping off points for you. This is the most visited feature of CVNP and it lives up to its billing. Come early if visiting in the summer to avoid the crowds! You can also enjoy an overnight stay at the Brandywine Inn or grab a meal at their restaurant for a quaint stay with the National Park. Another great, and family friendly, waterfall hike is Blue Hen Falls. The view from behind Brandywine Falls. This portion of the trail has since been closed. The front of Brandywine Falls on a crisp winter morning. 2. Biking. 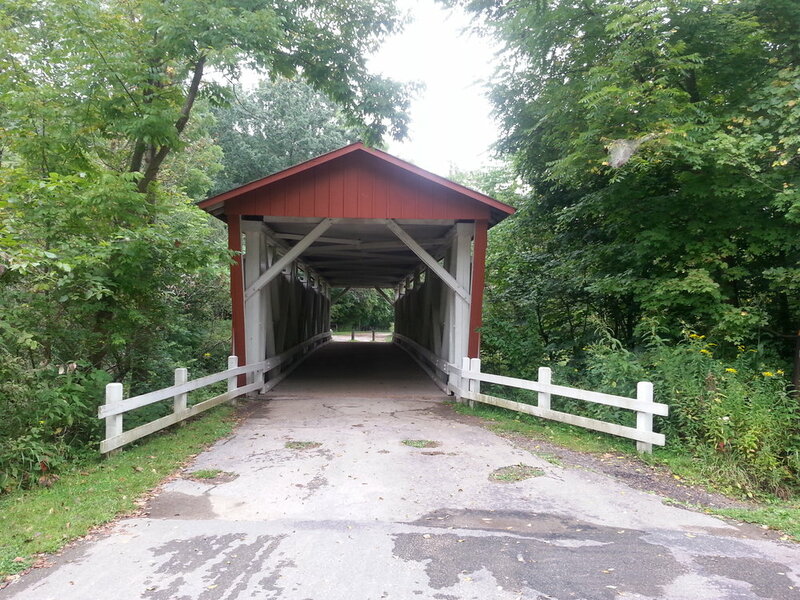 CVNP boasts a large portion of the 87 mile Ohio Erie Towpath Trail running inside its National Park boundaries. I love taking the mountain bike out on this trail and riding the day away. It runs along the canal where you can stop in several places and learn about the history of the canal system, the role it played in the development of the land, and it is a great way to get from point A to point B instead of driving to some of the hiking trails! 3. Skiing. Hit the slopes at the Boston Mills or the Brandywine Area ski regions. These areas are open typically from December to mid March. 4. Scope out beavers. The Beaver Marsh is an outstanding place to scope out, you guessed it, beavers! It’s actually a peaceful area to also spot toads, snakes, frogs, birds, and yes even an occasional otter! 5. Spot a covered bridge. What lets you know you are in the midwest or the plains states quicker than a covered bridge? CVNP has them too! From hiking to trail running to bird watching to a ride on the railway to catching an outdoor concert at the nearby Blossom Music Center CVNP may be Ohio’s only National Park but it’s definitely one worth a visit. While it winds in and out of residential areas and park boundaries this place has a special place in my heart. It’s not a park you need to spend two weeks at but it’s definitely one that I can and will continue to visit on fun day trips over and over again as long as I live in the same state. The US is fortunate to be adding to its National Parks in a world that continually sees damage done to its ocean, forests, and protected lands. CVNP isn’t the biggest or the baddest of the 61 NPS Units but its certainly one that deserves the recognition it receives. There are endless opportunities on how you can spend a few days in the park and I promise you won’t be disappointed by your time there. The Cuyahoga River cutting through the park that gives the area its names. What’s your home state or area National Park? What smaller National Park have you visited that you really enjoyed exploring? Leave a comment below and sign up for the emails to get our newest content, contests, and events on the last day of each month.